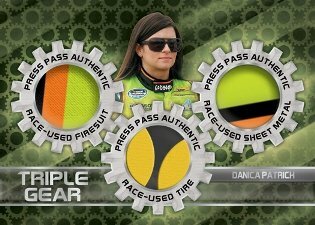 2012 Press Pass Racing kicks off another season of NASCAR with an upgraded autograph roster that's limited Sprint Cup Series racers and Danica Patrick. Inserted one per hobby box, Press Pass continues to produce some of the most unique memorabilia cards in the hobby with several levels and sets to chase. New hot boxes are inserted one per ten-box half-case, which include an autograph, two memorabilia cards and ten exclusive parallels. 100 card base set that's divided into seven subsets: Sprint Cup Series, Nationwide Series, Truck Series, Transporters, Front Runners, Head of the Class and 2011 Highlights. 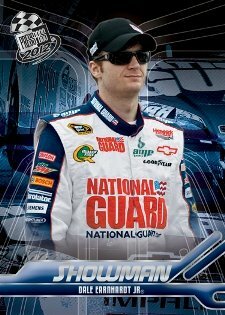 Cup Chase Redemption cards reward collectors with a special 12-card set if the racer featured on the card makes the NASCAR Sprint Cup Series Chase in September, 2012. Redemptions for the winning driver are good for an exclsuive memorabilia card. Every ten-box half-case will have a Fast Pass Hot Box that includes an autograph, two memorabilia cards and ten numbered parallels exclusive to hot boxes. Santa Claus returns with a special card. 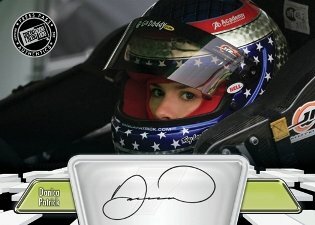 Autographs (1:90) include only racers from the NASCAR Sprint Cup Series as well as Danica Patrick. Every half case promises at least one autograph of either Dale Earnhardt Jr, Jeff Gordon, Tony Stewart, Jimmie Johnson or Danica Patrick. Press Pass Autographs represent the basic signature cards. Signed Press Plates are also inserted. 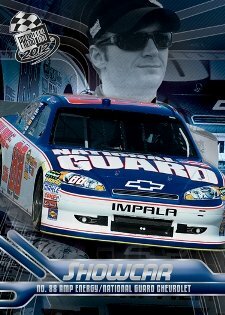 Signature Series Tire Edition (/12) are hobby exclusive cards that have autographs on race-used tires. Hobby-only Signature Series Eclipse cards (/12) include different pieces of race-used pieces. Burning Rubber Race-Used WIN Tire contain pieces of tread from 2011 RACE-WIN races. Buring Rubber Prime Cuts (/25, hobby only) have premium tire swatches. Inserted in hobby packs, Triple Gear cards are available in three levels, depending on the number of memorabilia pieces (one, two or three). 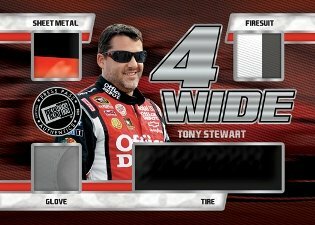 Hobby exclusive Four Wide cards have three pieces of race-used memorabilia and one over-sized swatch. Each card is offered in four different versions. Ultimate Collection (hobby only) available in two versions. Preferred Line (nine cards, 1:15). NASCAR RACING 2009 Press Pass PREMIUM Factory Sealed Box LOGANO KESELOWSKI RC?? ?